Soybean seed should be treated with a fungicide because water-soaked soggy soil, when coupled with very low soil temperatures, will result in post-imbibition, germinating seedlings being exposed to pathogens that will attack them. If you have experienced overwintering bean leaf beetles infesting early planted soybean fields, use seed treated with fungicide and insecticide to prevent bean leaf beetle feeding and potential infection with bean pod mottle virus (BPMV). These beetles feed on early planted soybean seedling cotyledons and unifoliate leaves to get enough food to lay their eggs in the soil beneath emerged soybean seedlings. Those eggs will hatch and the beetle larva will feed on your soybean seedling root system. The article Predicted Mortality of Bean Leaf Beetle is Highly Variable provides bean leaf beetle overwintering information from Iowa State University for the 2014-2015 winter season. (Update: Also see 2016 ISU update: Predicted mortality of bean leaf beetle is low.) More in-depth information on the life cycle and biology of bean leaf beetles can also be found in this information from Iowa State University: Bean Leaf Beetles. Additionally, new research published in Crop Science this month shows higher soybean plant populations are obtained with the use of fungicide/insecticide seed treatments. Soybean seed requires 50% more water than corn seed to initiate germination. Do not put your soybean seed into a dry furrow — imbibition does not start until germination begins. 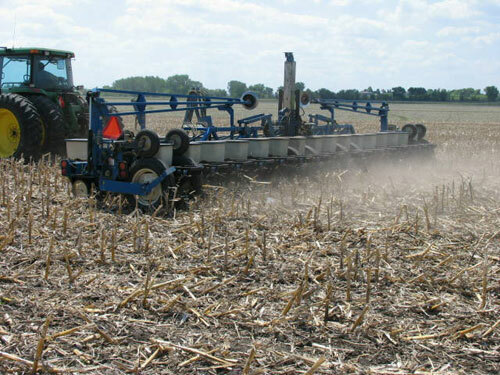 Consider planting deeper to moisture in some cases. Replanting payments will not be made on acreage planted prior to April 25 with crop insurance. However, numerous seed companies provide 100% replant coverage on soybean seed treated with a fungicide/insecticide product or through brand loyalty policies.